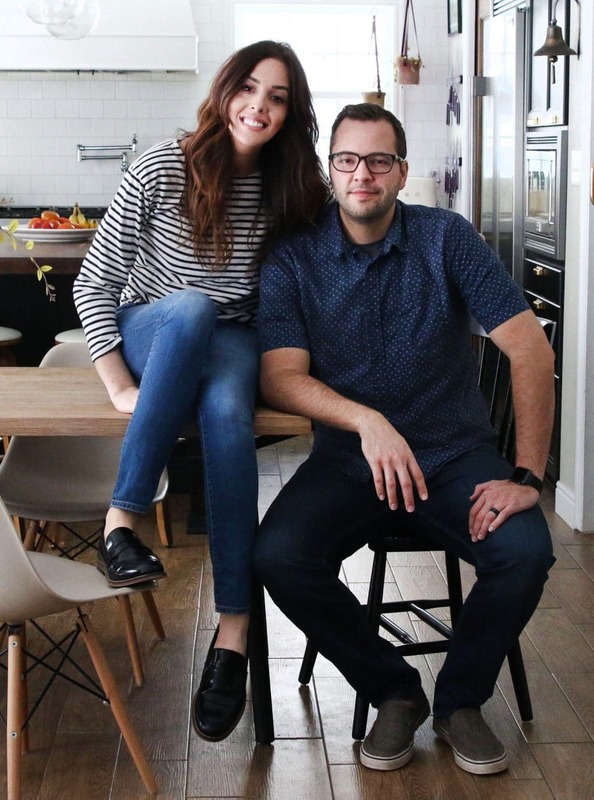 Today, I wanted to introduce you to a few favorites around our home. In the kitchen, I love to keep a big vase on the island with some greenery. It helps me keep the surface clean and the kitchen looking so fresh. By the window, we keep hanging pots (these are from Target and no longer sold, but I linked similar below) and recently added faux herbs. It started with real herbs, but Chris actually uses more basil than the pot can keep up with. 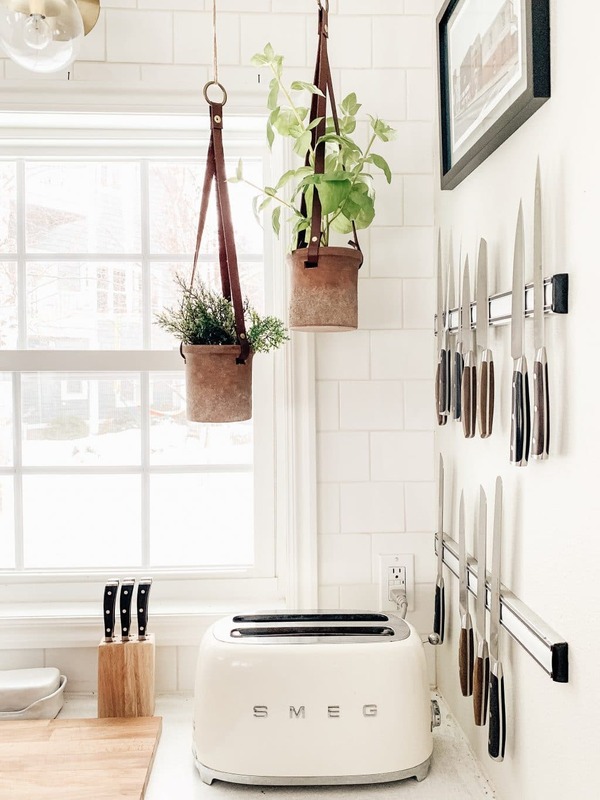 I had gotten used to the greenery hanging and found these faux herbs that do the trick. We have two faux fiddle leaf figs. The first is a 5′ tall one in the stairwell. It’s so incredibly realistic and under $60 (this offer comes and goes, so if you’re thinking about it–I’d pounce!). I couldn’t recommend it enough! When you first get it, take your time and fluff the leaves and twist and turn them until you’re happy with it. I like covering the base with a blanket. The other is in our bedroom. It’s a 7′ one that we’ve had for a few years and I still love it. 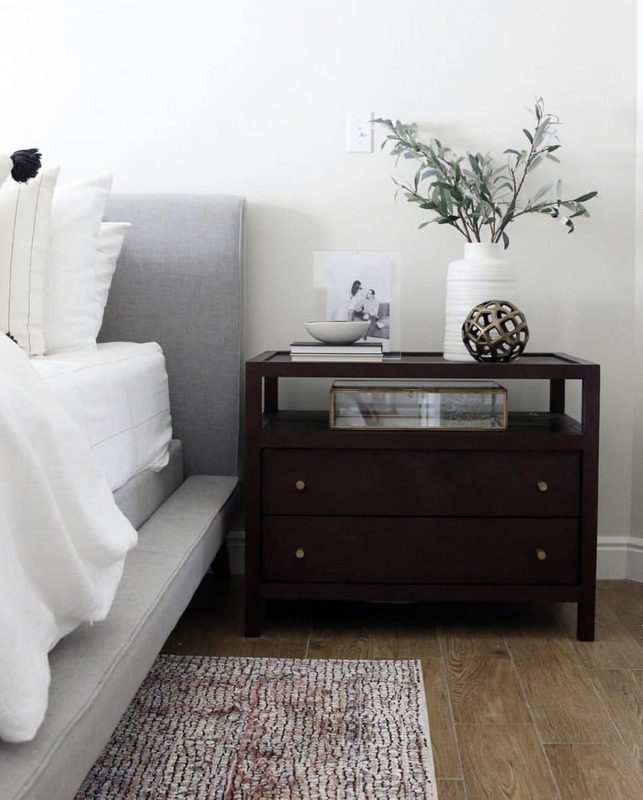 There are some faux olive branches on the nightstand which bring in a cooler sage tone. 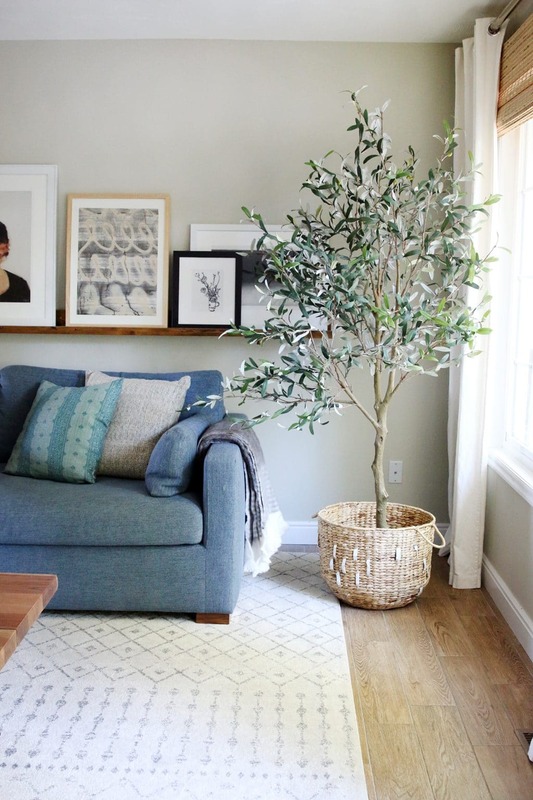 We carried the same, smaller-leafed olive tree into the living room with this faux tree. It’s so airy and light but makes such a difference in the space. 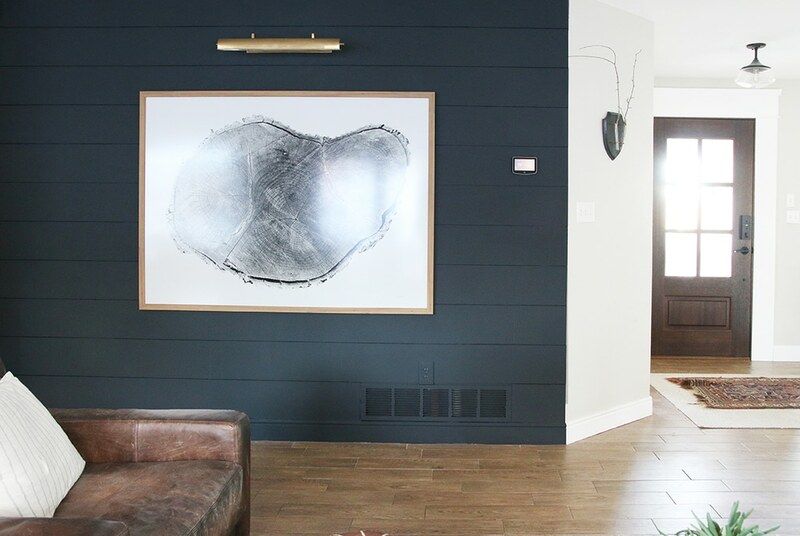 A Dark Shiplap Accent Wall for under $75! I love all of these ideas. I am a faux plant in the house kind of gal as well. Where did you get the other hanging herb? Or is it real? It’s faux too! Got it from McGee & Co! I love these ideas…thanks for sharing! I have never been able to keep an indoor plant alive. I also have a kitty, so she makes real plants a not-so-great option. I loved this post! I’m terrible at keeping plants alive and I struggle knowing what to pick, so thank you!! I’m curious too if you will have faux plants in your cabin and what they might be. I loved the christmas tree you chose! We aren’t really at that stage of the cabin reno yet, but the tree was faux (from Balsam Hill) and it was awesome! I’ve been so torn with this in my own home for so long. I can keep plants alive (for the most part) but succulents/cacti I kill EVERYTIME! I want plants in my home not only for beauty/greenery but also for the air purifying benefits so I struggle with adding plastic plants that just off-gas nastiness into my home. It’s a function over form struggle I have. I did replace all the little pots of dying succulents and cacti I have and that has made me so happy. Maybe that’s my compromise, ha! We also use an air purifier and almost always have an oil diffuser going…which is probably more purifying than an actual plant can do. 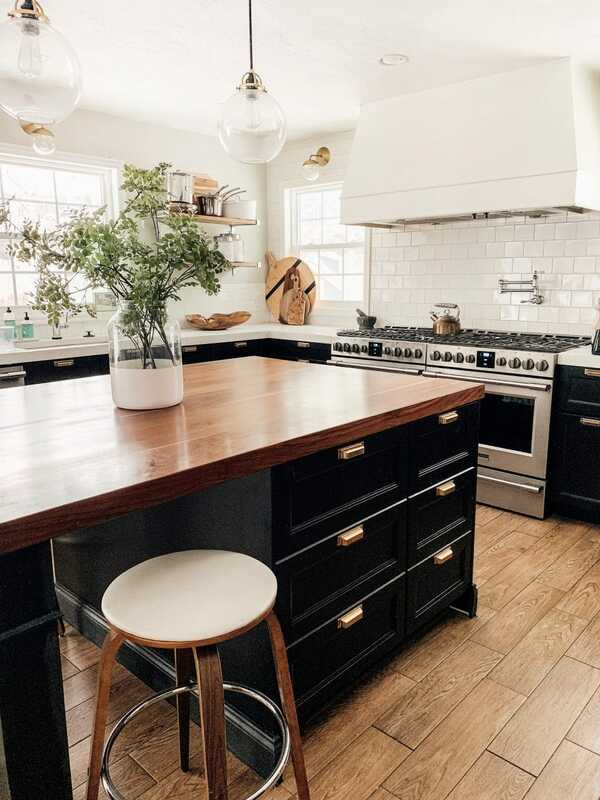 Love the look of the branches in your vase on the kitchen island! In one of your stories I believe you shared how many stems you used to achieve that look…I’ve scoured and can’t find it (which led me to believe it was from stories). Could you share? Is it 3? Thank you for all of these! 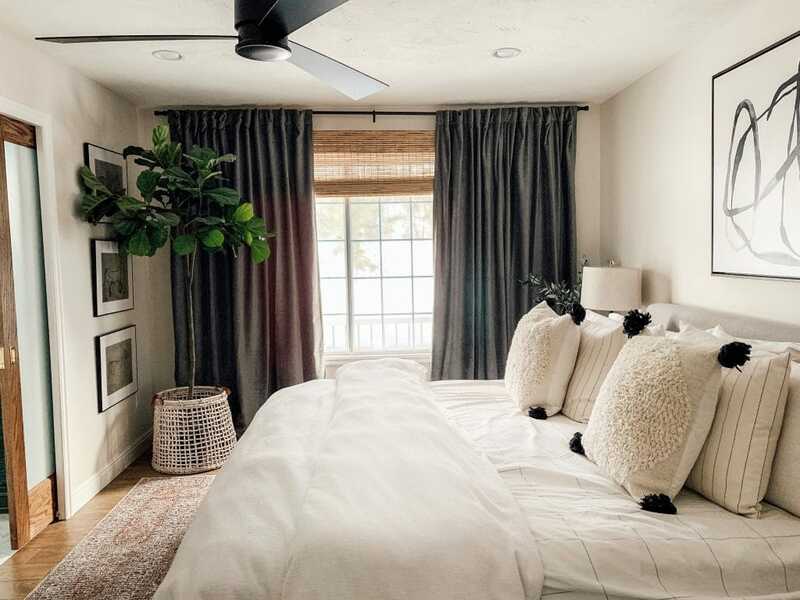 The link for your bedroom fiddle leaf takes us to a 6 foot from world market not a 7 foot – is the 6 foot the actual size you have? Or do they just not carry the 7 foot anymore? Thanks! I think they changed it to say 6′ but it’s a little over! Thanks for this post, Julia. I love your house and how you decorate. I am always hesitant to buy faux online because I never know how they really look in real life. But now I can buy in confidence. If it’s good enough for Julia, it’s good enough for me!! Thanks for all your inspiration! I see you covered one with a blanket. What other ideas do you have to cover the base? I feel like Spanish moss is not longer in style. I really love doing a blanket! And I’ve seen spanish moss still work. Thanks for the post, Julia. How do you clean you fiddle and olive tree? One reader mentioned using the tub (brilliant! ), but is it cumbersome with a “tree”? And how long/often do you find yourself cleaning your plants? I just dust it with a swiffer when I think about it and take a damp rag to it once a quarter. Aw man I was drooling over your olive tree but even with a coupon I couldn’t justify a $400 fake tree when I still need to furnish the rest of our house. Any recs in a more cost friendly faux olive tree? Check out this post! I linked a bunch! Love this post! We have so many plants around our house that I love the look of, but just can’t keep up with the maintenance and mess. Not to mention the expense of getting fresh stems and flowers each week. Would you mind sharing which size basil drop in you have? Is it the Small (9inch) or Large (18inch)? Thank you for this! There’s a space in our bedroom that I have been thinking needs some greenery. We put a skinny Christmas tree (fake of course) and I haven’t had the heart to put it away yet. Leaning towards an olive tree vibe since it seems more airy. I always have to have fake plants inside, real ones make me sneeze! Plus they die ha! Thanks again! Can I ask you if you cut the silver dollar eucalyptus from PB? I went to the store to buy some and while I found it to be very pretty, it was HUGE. I have been using real silver dollar eucalyptus, which lasts several weeks surprisingly. It’s so long! I did cut it with wire cutters. Just ordered the QVC Fiddle Leaf Fig Tree you mentioned. Thank you for your recommendation! I’ve found them on Overstock! Every single one of these, with the exception of the hang herbs, looks so fake and cheap. And fake plants are so wasteful! They end up in the landfill at the end of their lives and are petroleum based products which is harmful to the earth and polluting the air in your home….whereas real plants actually purify the air in your home. Sorry for the buzzkill comment, I know fake plants illicit a lot of controversy and I am firmly on the side of THUMBS DOWN. They look fake no matter how much you try to convince yourself or your readers otherwise. You are 100% entitled to your opinion and I get the controversy. I just really enjoy them. They make my home feel more alive without giving me a guilt trip every time I look over and another one died. Nearly all of the “plants” in this post I’ve had for a good, long time and have received countless compliments on. Nicely said. Way to keep your cool when the tone of the commenter was clearly critical and harsh. I think your plants look beautiful, whether they are believable or not. Your taste and home are exquisite and I’m inspired to make my home just a little bit as lovely. Katy, you might want to learn a little bit about the “real” plant/seashell/flower/coral industries before blanketly condemning the “fakes”. They also have their problems (hello DDT and child labor to mention two). Seriously! Where do people think “real” plants come from? They’re not picked by fairies in the forest LOL. I worked in the floral industry for years and now as someone who is learning sustainable/organic agriculture to farm my own land I realize that the methods used for growing indoor and exotic plants is mostly terrible for the farmers and the environment. From fertilizers to pesticides the amount of chemicals used is just bad, so please choose your live indoor plants with care #knowyourfarmer. Also, households with small kids or curious pets might prefer artificial plants because some of the popular indoor plants are really poisonous. My mother in law throws her fake plants in the shower to dust them so-easy clean! I think we can all agree that a pop of color from some greenery (living or fake) can bring us joy and that is what home is all about! Or how about the general tone of Katy’s reply – so harsh! Talk about a buzz kill…….there are nicer ways to phrase the not-so-nice things you want to say (or write). ME TOO! Everything I love is always on both of these websites and it breaks my heart EVERY. SINGLE. TIME. This is an awesome post! Thank you!! 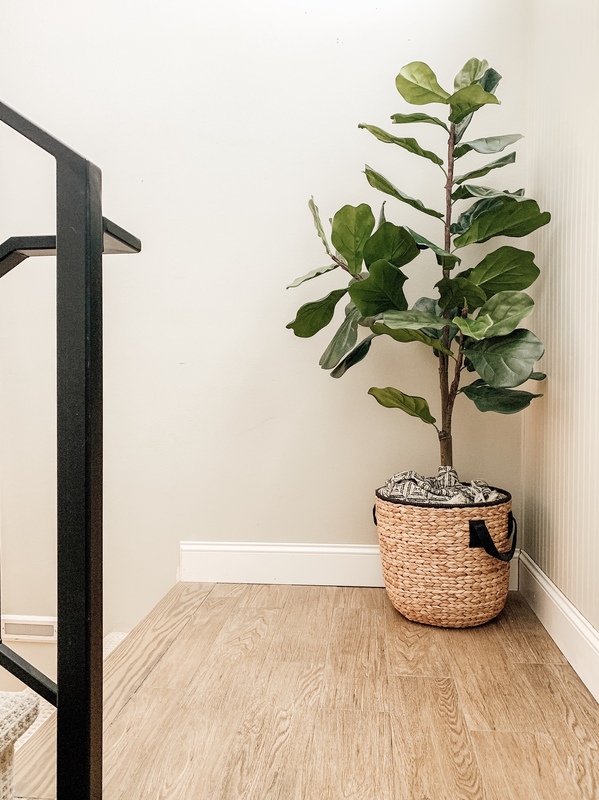 I bought the 5’ QVC fiddle leaf and they have an extra promo going on right now for $10 off for new users! I bought the QVC one after seeing it on your IG story — can’t wait to get it! Joanna Gaines also created faux fiddle leaf figs for the latest Hearth & Hand line at Target. I bought all three sizes…they are very realistic and come in beautiful pots! I really want some olive branches but Crate and Barrel only have them for store pickup and there isn’t one in the Treasure Valley. I think that the ones at craft stores aren’t realistic enough. I also have a collection of faux plants, my fave is my seagrape tree! I am struggling to keep my real fiddle leaf fig alive so maybe I will get a faux one.